A brief history of the quintessential Southern beverage. This is part three in our series exploring tea’s place in the culinary canon, sponsored by Pure Leaf. When dining in the American South, one of the most discernable and impressionable moments comes when the tea does. Iced tea, or as is more common in the region, sweet tea, is the most essential beverage of the Southern table. The presence of tea, particularly offered in one's home, is most often in a chilly pitcher with thin wheels of indiscriminately floating lemons. In restaurants, it may be delivered as the guests are settling in — and though it may be second nature for Southerners, ordering a tea remains an enlightening experience to the uninitiated. Whether you order tea or sweet tea, you’ll get the same result. There’s only one way to serve it in the South. Those who scoff at the merits of sweet tea (are there such people??) have clearly never had it alongside a smoked pig brushed with a tangy glaze, or paired with salty, cornmeal-crusted catfish at a church picnic. And they must not have experienced the pinnacle of leisure: porch-sitting with a tall pint glass of sweet tea on a sunny summer day. To better understand tea’s place in the Southern cultural canon, we chatted with Southern food writer, Sheri Castle, about its unique history. There’s good reason the unofficial drink of the Southern everyman (and lady) feels like a little luxury, Castle says. For a long time, it was. All of the raw materials it required — the sugar, the tea leaves, the ice — were expensive, unfamiliar, and controversial. Around the same time that tea was used by colonial merchants and patriots as a tool of political protest, a French botanist named Andre Michaux brought camellia sinensis, an evergreen shrub whose leaves and buds are used to make tea, to the Carolinas. South Carolina quickly became the home of a short-lived domestic commercial tea industry. Though the fabled heat and humidity of the South quickly snuffed that dream, a taste for the beverage stuck around. When ice began to travel around in sawdust-filled boxes in the 1800s, tea’s permanence on the Southern table began to look like a possibility — for a price. Since status symbols were created then as they are (fueled by demand, and prohibitive costs) the presence of a chilled glass of sweet tea was soon an indicator of class. It’s no Big Bang, but credit goes to Marion Cabell Tyree for publishing the first sweet tea recipe on record in a community cookbook called, Housekeeping in Old Virginia, in 1879. But as Castle correctly notes, the fact that it made it to print suggests it had already been established in the culture years before. During a particularly hot St. Louis summer in 1904, ice cold sweet tea finds an adoring public in the crowds of the World’s Fair when one vendor uses iced lead pipes to cool down his hot tea no one wants. By Prohibition, tea is the undisputed beverage of choice for those elite searching for booze alternatives; it even has specific stemware and cutlery to match. 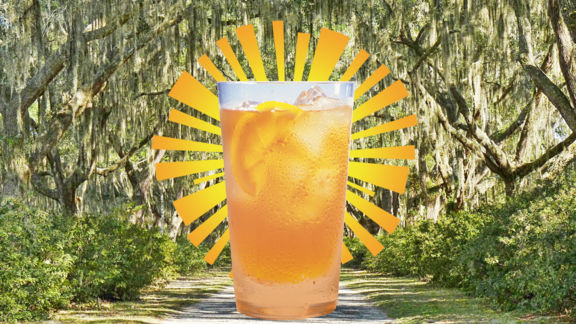 Credit goes to refrigeration for really changing the game for sweet tea; when electricity comes to rural areas in the mid-20th century, slowly, but pervasively, the drink crosses over race and class lines. And then, as most traditions tend to do, it endures for years — and an untold number of gallons. Sweet tea makes it onto the tables of those who would grow up to be the immensely talented chefs helming the new Southern culinary movement of today. It remains as a touchstone to a time when a young America had a brief but memorable fling with a domestic tea industry, to hot days, and to a cuisine that persists despite twisty, strife-laden roots. But if you’re already a steadfast sweet tea loyalist, here’s what they call a pro-tip: Castle tells us some folks swear by a tiny pinch of baking soda to fix any inherent astringent notes to the tea and keep your drink stable over longer periods of time. That way, you guarantee relief for those languid afternoons on the porch. Of course, if the heat has already slayed your resolve, or you like your tea on the go, Pure Leaf Sweet Iced Tea might just do the trick. A Californian chef cooking in the South considers the place of tea.